Figure 1. Anthracnose top dieback symptoms. Photo: Agrigold. Many of us are familiar with Anthracnose leaf blight and Anthracnose stalk rot, but many of us were caught off guard this year by another form of disease, Anthracnose top dieback, caused by the same fungal pathogen Colletotrichum graminicola. Reports of this disease have been received from all parts of the state in the past week. It affects silage and grain hybrids and is readily identified by its typical symptoms of death of leaves and stalks in the upper 1/3 of the canopy (Fig. 1). It’s important to note that top leaves my die from a number of factors, including corn borer, drought and other environmental stresses. Therefore, accurate diagnosis is important when suspecting this disease. Symptoms initially involve purpling or yellowing of flag leaves, and is often more randomly distributed in a field than top dieback caused by abiotic stresses. Anthracnose top dieback is the result of the fungal stalk rot occurring on upper internodes, which restricts upward movement of water and nutrients, thus resulting in necrosis of leaves, tassels and stalks above the point of infection. The easiest way to identify Anthracnose stalk rot and top dieback is to look for signs of the fungal pathogen. 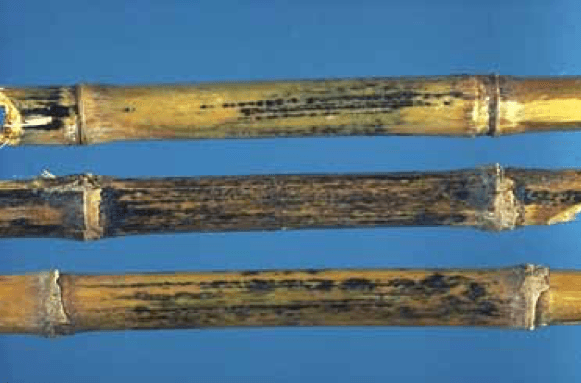 Examine stalks for the typical black anthracnose lesions on the stalks, and peel back the leaf sheath to look for the black fungal fruiting bodies, called acervuli (Fig. 2). A hand lens is helpful in identifying these spiny fruiting bodies, which may be full of pinkish, wet spore masses under moist conditions (Fig. 3). Split stalks will reveal rotten or disintegrated pith tissue at the point of infection (Fig. 4). Figure 2. 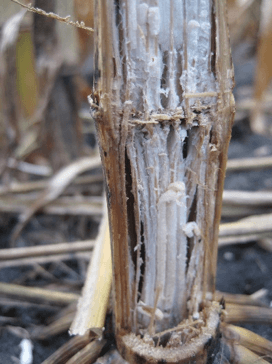 Anthracnose stalk rot lesions on stalks. Photo: Ohio State University. Figure 3. 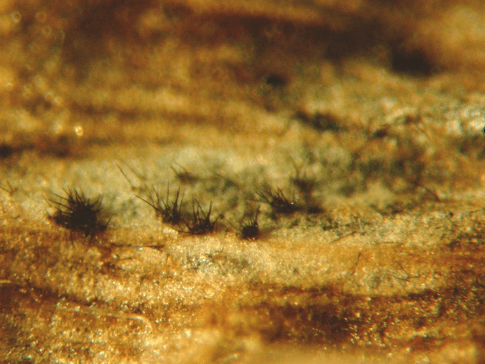 Colletotrichum fungal fruiting bodies called acervuli. Photo: Cornell University, Nelson lab. Figure 4. Anthracnose stalk rot internal stalk symptoms. Photo: APS Press. This pathogen overwinters in corn residues and spores are transmitted via wind and rain and can infect corn plant roots or stalks. Insect feeding damage may enhance infection by this pathogen. Since this pathogen is more prevalent in fields with high corn residues, crop rotations can significantly reduce this disease. 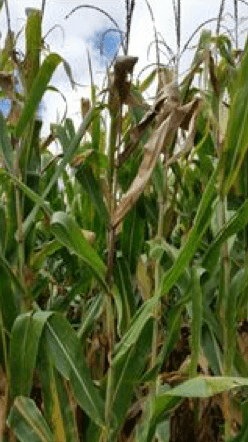 Hybrid resistance is available for anthracnose stalk rot, and hybrids with good foliar disease resistance often reduce stress overall, resulting in less susceptibility to stalk rots in general. The IPM approach to managing anthracnose top dieback in your fields would involve crop rotations, planting resistant hybrids, and cultural practices to ensure minimal plant stress (balanced fertilization, adequate plant populations, and proper drainage). 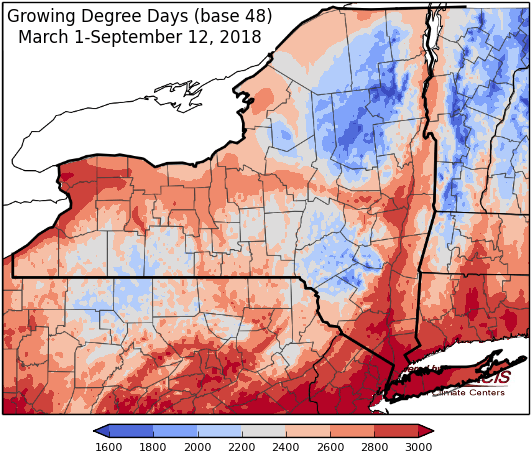 It has been an optimal year for sudden death syndrome (SDS) in some parts of New York State. Reports and diagnoses have been received in western and northern NY fields. This disease is favored by cool, wet spring conditions, followed by hot and dry weather. The infection occurs very early, at germination and emergence, but symptoms rarely appear before reproductive stages and pod filling. Symptoms are most obvious as interveinal chlorosis on the leaves, and can be confused with other diseases that have similar foliar symptoms, including brown stem rot and northern stem canker. Splitting the stems of an SDS infected plant will reveal a white pith with discoloration of the vascular tissue of lower stems (see photo). Few varieties adapted to our region are available with moderate resistance to this disease, and rotation is not very effective since the pathogen can survive for many years in the soil and on other crop debris. 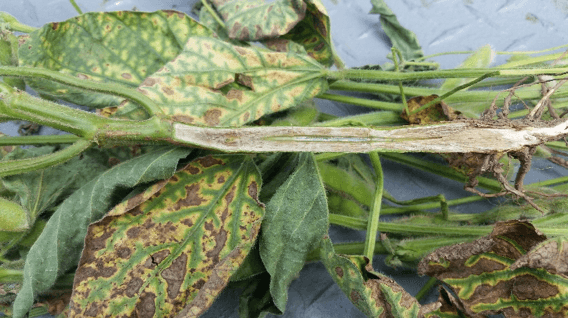 The ILeVO seed treatment has shown good results in trials from other states, and may be your best bet for managing SDS in fields with a history of the disease. Improving drainage and compaction and delaying planting until soils have warmed up, in addition to planting moderately resistant varieties (where available) with seed treatments, are good IPM practices for fields affected by this disease.